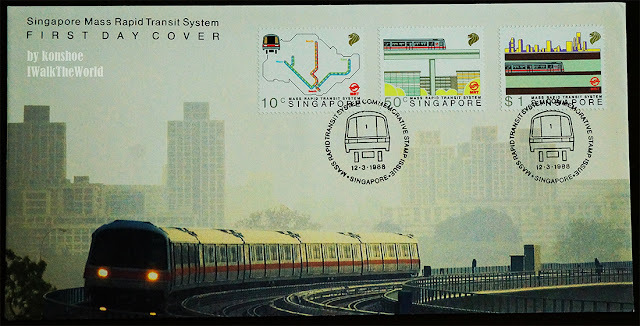 The sharing of London Underground inevitably led me to recall Singapore's own impressive system of mass rapid transit. Singapore's main reason to build such a system mirrored that of London's albeit the former has a much more urgent need for it. In land scarce Singapore, a projected rise in the number of population will follow with a rise in transportation needs, which buses could not provide adequately. The FDC from the day when Singapore's MRT commence operation on 12th Mar 1988. Notice that the MRT map depicted in the 10 cents stamp differs a lot from the one that is familiar with us in 2013. Extensive studies in 1970's concluded that such a system will be required to alleviate the potential problem of moving people and traffic congestion. By 1982, the MRT project was approved, making it the biggest public works project in that decade, and construction began in 1983. This FDC was released to commemorate the completion of construction and beginning of operation on 12th March 1988. Current visitors to Singapore will see 4 MRT lines serving the country's need, namely the East-West line (Green line), the North-South line (Red line), the North-East line (Purple line) and the recently opened Circle line (Yellow line). But the 10 cents stamp reminded visitors that this was not the case back in the days. Only the former 2 lines existed, and not all stations available now was constructed then. 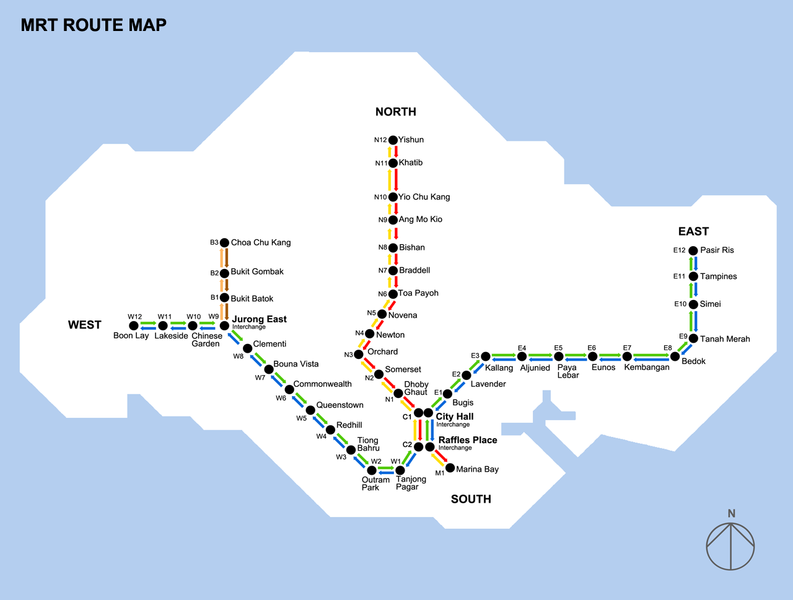 Up to the completion of the planned system in 1990 (it was originally planned to complete by 1992 and the system completed ahead of schedule), the Green line does not have Pioneer and Joo Koon station to the west, and the Red line was not connected in the north. A recreated map showing the line map used in 1889 - 1996. MRT passengers familiar with the current system will notice the disconnected North-South line to the north and the lack of stations past Boon Lay to the west (image taken from Wikipedia). The colored representation of each line seen nowadays was not the same in the days past. Each direction was colored differently even though they traveled on the same line, with the central district as the initial point of travel. In my imagination, and in no small part due to my familiarity with current system, the old system seemed to be rather cumbersome. As is the case with London Underground, most of the stations and tracks are not underground. In fact, the island republic faced an even bigger issue - the scarcity of land. This caused them to move the tracks even higher to run over the street level as depicted in the 50 cents stamp. In the central district however, this was not possible due to buildings already clustered around the area. your problem or start a business with Loan paying of various bills I think you have come to the right place just email us. Travel theme. Theme images by kelvinjay. Powered by Blogger.